picture is from around 1960. This is a very good picture so I hope we can get these young ladies all identified. Cessna. I also know #13 is Laverda. Jill Menzie and Laverda Cessna have helped me out some more on some of these. 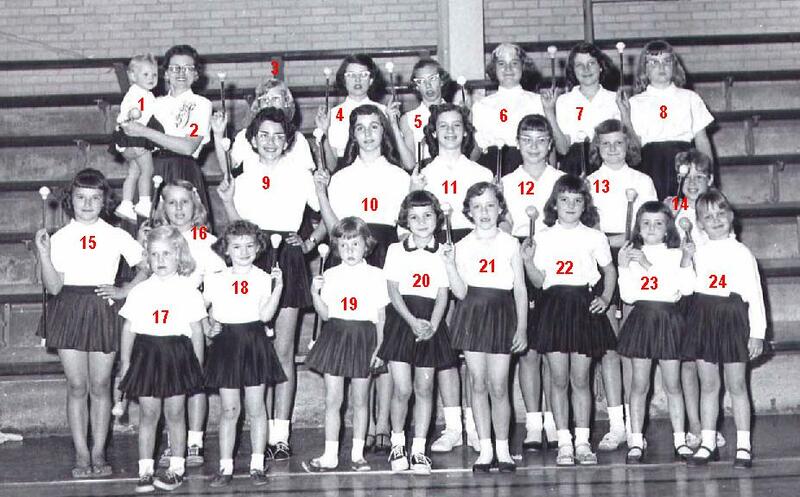 #3 is Sherry Newsome, #5 is Joyce McAlpin, #6 is Bonna Brinkman, perhaps #7 is Robert Davidson, #8 is Kathy Magouirk, #9 is Barbara Barhydt, #10 is Susan Sauer, # 11 is Karen Jasper, #12 is Mary Benton. Laverda thought #18 was Sara McFarland but Sara has identified #17 as Dee Butcher, #18 as her sister Greta, #19 Suzie Deardorf. #11 Karen Jasper Laverda Cessna knew the Karen part, I came up with Jasper. MANY THINK THIS IS ANITA. I BLEW IT UP AND IT MIGHT BE. Midge Holsten, Jane Wehkamp, Becki Taylor.